The extrication of seriously trapped patients from a vehicle following a collision is a difficult and challenging job for even the most experienced rescue teams. Even though the last 25 years have seen a great advance in knowledge, techniques and equipment – not to mention the proliferation of information made available on the internet – it still remains a complex skill. We know that, from a global perspective, most extrications involve single or multiple passenger cars. As a result, this scenario has formed the basis of our training and development over the last quarter of a century. So when it comes to these kinds of incidents, our knowledge base is vast and continues to grow. What is evident however, after my numerous discussions in a lot of countries, is the fact many rescuers around the world do not feel they have the same level of knowledge when it comes to heavy rescue (like incidents involving trucks); but why? My answer to this question is based on the fact that in my career I felt the same, mainly due to the following considerations. Operational exposure to heavy rescue incidents is much rarer than extrication from cars. Also, obtaining trucks for training is difficult and expensive, in fact it is nearly impossible unless you are fortunate enough to attend a heavy rescue training course. Such training is often only reserved for instructors, who have to then cascade this knowledge to others within their organisation. While this is of course beneficial, it excludes operational rescuers from receiving first-hand input and the ability to practice techniques ‘for real’. The net result of this is that rescuers (and previously me too) feel less confident. Simply due to the lack of exposure, familiarity and the inability to regularly train and hone their skills. Because of this situation, mastering the basics is difficult enough, never mind really pushing the boundaries when it comes to heavy rescue. That being said, as ever I would urge everyone to look at the basic principles of extrication, no matter the kind, size and shape of the vehicle. The Team Approach still applies although with incidents involving trucks each phase is technically more challenging, it still provides a solid basis for training and operational incidents. Before we look at the individual phases of the Team Approach, it is important to consider the construction of the truck. It will (likely) either be cab over engine (popular in EU and Asia) which sees the driver sitting far forward over the engine and front axle. Alternatively, and mostly seen in North America, we see a truck construction more similar like a car where there is a hood (bonnet) forward of the cab. The important consideration here is the likely mechanism of injury that will result in a frontal collision. The former offers far less protection to the driver due to their driving position, whereas the latter provides more protection due to the construction type. Remember that kinematics (reading the incident scene to establish a likely mechanism of injury) is an important step when planning your extrication. You must also consider the possibility of vehicle relocation. Very often in my career, extrications were delayed due to restricted access. Therefore ask yourself if it is possible to move the vehicle in order to make your job safer, easier, more expedient and therefore patient centred. Truck construction is no stronger than that on cars. Before we think about the stabilisation of a truck we must ensure that we totally negate any possibility of it moving. If it can be done safely, application of the parking brake must be considered along with assessing the viability of repeatedly pressing the footbrake. This will exhaust the pneumatic system and therefore apply the brakes. Also consider the use of winches to prevent movement. Specifically designed truck wheel chocks MUST be used as conventional methods for stopping a car moving, simply will not be sufficient. Depending on the type of truck it will likely have a pneumatic suspension system which, if damaged, can lead to the truck lowering during the rescue. This is especially critical if the incident is an under run i.e. a car has gone under the rear trailer. Another consideration is the lift axle. This is a wheel that is often only lowered when the vehicles is heavily laden. All other times the lift axle is held in position pneumatically. Older vehicles can lose air from pneumatic systems if the engine is shut off. For this reason it should be considered (where practical) to leave the engine running in the initial stages, until these systems have been checked. This will maintain the vehicle at its ‘ride height’. Lift axles can be chained/blocked in the up position and the trailer should be stabilised using shores. In addition, landing legs should be lowered where possible. This will create a safety cell which will allow rescuers to access under an air suspended vehicle. Once the vehicle is stable and there is no risk of movement, access can be gained. By definition, this will require working at height and although an access platform would be the first choice, it is unlikely that it will be on scene at this early stage (very often it arrives later on a specialised rescue vehicle). Access may have to be gained using a ladder. Glass management is no different on a truck than on a car, with one notable exception; the windshield. A laminated windshield on a truck is large and heavy and will require several rescuers to remove it safely. Once this has been achieved however, it provides critical access for rescuers and equipment. The rest of the glass should pose no problem. It will either be toughened (tempered) or laminated. Do larger vehicles require larger tools? Vehicle dimensions are larger on an undamaged vehicle. Post collision, where the driver is mechanically trapped, the intrusion will likely be so severe that the actual length requirement of a hydraulic ram may not be so great. A shorter ram equates to less weight and less burden. As there is no statutory requirement for trucks to be submitted for crash testing (although some crash testing is carried out) my experience leads me to believe that their construction is no stronger than that of smaller road vehicles. So it is highly likely that a medium sized, lighter cutter will perform the required task, is easier to use and limits the physical burden on the operator. Finally consider that any rescue of this nature requires the operator of rescue tools to effectively operate in a confined space. Tool dimensions are critical in order to gain access and work safely and effectively. I would urge rescuers to look critically at the kinds of applications they can expect to be faced with during heavy rescue operations and relate that to the size, weight and hydraulic capacity they require from their tools. A full roof removal is not really an option. It is timely and takes specialist lifting equipment. Therefore your extrication path is generally limited. We must take this as a positive; less choice will mean less debate on scene and result in a quicker decision. Generally the patient will come out through the side and they will have to be rotated. While we know that we would ideally like to keep them in a straight line (due to their injuries) this is seldom ever a possibility. Once more, removing a patient from a truck requires working at height and is labour intensive. Ideally an access platform will be available at this stage of the rescue, making it safer and easier. As rescuers we always feel better and more confident if we are well practiced and our skills have become second nature. 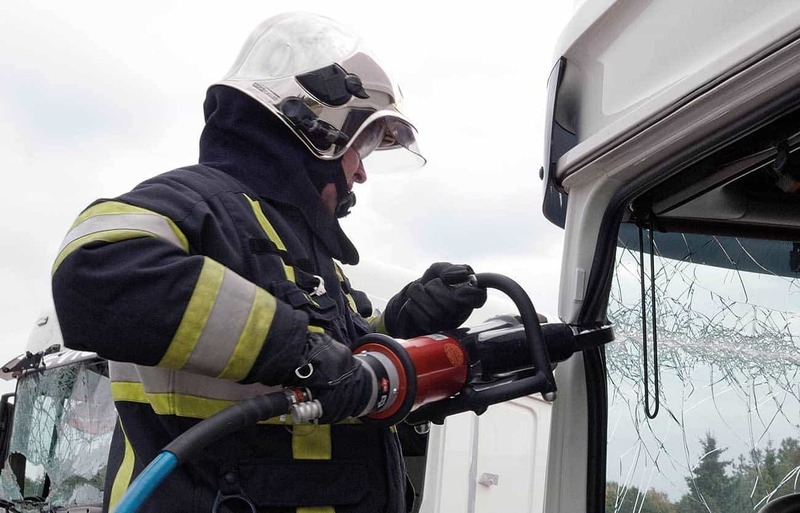 With regards to rescue from cars, this is something most of us achieved early on in our careers; easy access to training vehicles and attending many operational extrications saw to that. However, heavy rescue is very different. We attend far less incidents and rarely (if ever) do we get our hands on a truck and walk through our team approach in a controlled environment. We hardly ever get to practice stabilisation techniques, door removal or relocating a dashboard or lifting a patient from a truck. This is far from ideal, but there is a lot of value in reverting back to the Team Approach as your starting point. Extrication from a truck is more complex and more challenging. It requires an underpinning knowledge of truck construction, an understanding of the pneumatic and hydraulic systems and how to assess a load. This knowledge combined with our core skills which have been refined over the last few decades is a great place to start in order to develop our approach to heavy rescue. In an ideal world, we would have an inexhaustible supply of trucks to train with, unfortunately that is not the case.